When Bobby and I drove past Equicare on our way home from Arizona and I realized exactly what kind of facility it was, I tucked that tidbit of information in the back of my mind. I figured that maybe someday I’d call and ask about pricing… I guess I just assumed it would be expensive, since it seemed fancy. Then a couple weeks ago a friend of mine posted on facebook about taking her horse there, so I messaged her and asked her what she thought about it and what the prices were like. I was blown away by how cheap it was – only $35 for the aquatred and $45 for the saltwater spa. I did a bunch of research online about both, called and talked to the owner of the facility, and booked Henry an appointment. I was especially interested in the aquatred because Henry is conformationally weak and perpetually a bit stiff in his lower lumbar area. Engaging that part of him is really difficult for both of us, and while we’ve had some success using certain exercises under saddle, it’s obviously been really slow going and not particularly consistent. The aquatred is supposed to be great at targeting those muscles. I also wanted to put him in the saltwater spa, just to see what we thought about that treatment. Henry’s got the typical wear and tear on his ankles that you see in horses that raced, and now he has another fairly demanding career full of galloping and jumping. Anything that could help reduce inflammation and increase blood flow to his precious lower limbs is a-ok by me. Plus he banged his hind ankle pretty hard while playing out in the field a couple weeks ago, and while superficial, it’s been slow to heal. You claim the saltwater spa can help both things? Sign us up. We started out with the aquatred. They led another horse through in front of Henry to let him see that he wasn’t gonna die, and then started leading him slowly down the ramp. He planted his feet for a couple minutes and took a good look with several snorts, but eventually acquiesced and very gracefully (heavy sarcasm) walked down the ramp into the water. You have to play this video, if only to see his face at the end. Once he walked forward onto the actual treadmill part they let him stand for a minute to settle, then slowly started adding a little speed until he figured out how to walk in the water. As soon as he started moving he was golden, and plodded right along. It was REALLY cool to watch him in there and see exactly what muscles were getting the most workout. Pretty much all of their “sit” muscles, basically, and a wider range of motion than they normally use. I had to video it because it was so cool to see all those muscles working from above. Since it was his first time they left the jets off (the jets add extra resistance to the water to increase the intensity of the workout) and only had him stay in for about 7 minutes. They prefer to start them slow and gradually build up, so the horses don’t get too anxious or tired or sore. Even though he’s a really fit horse, he was still a little bit veiny from exertion when he came out of the water. From there they stuck him on the equiciser, to let him walk and settle and chill out for a bit before he got into the saltwater spa. The spa is a little bit of an intimidating looking machine, and it fills with very cold water, so they want to start with a calm horse. After a few minutes on the Henny-Go-Round (which I found endlessly entertaining, although he spent most of the time tormenting poor Wyatt, the very sedate QH they put in with him as a buddy) they brought him in, hosed his legs off, picked his feet, and put a diaper on him. Yep, you read that right. No pooping in the saltwater spa. I thought he might be a little dumb about this one, because its a small narrow space that they have to step up into, but he walked right in, they closed the doors, and then it slowly started filling (up to his knees) with water. His eyes bugged out a little at first, then he started wanting to paw and play with the water, but for the most part he was totally chill about it. After a few minutes he started making his normal goofy Henry faces, which usually means he’s bored. 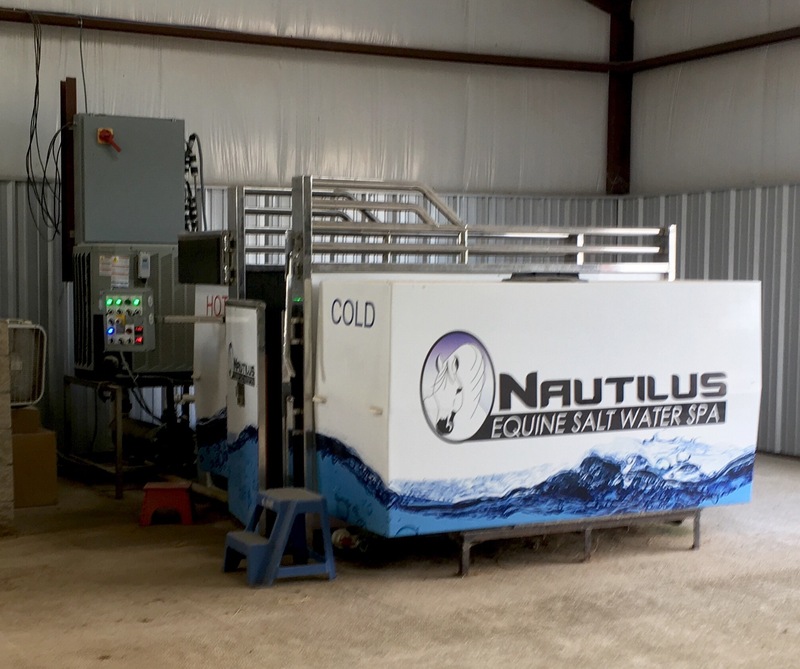 Once that was done the machine drained the water, he walked out, and then they stuck him back on the equiciser while the owner showed me around and told me about all the cool new stuff they’re adding. It’s already an awesome facility, but it’ll be pretty incredible when they’re done. I’m pretty excited to know that this place is only about an hour’s haul away… I see lots more aquatred in Henry’s future! Apparently out of hundreds of horses they’ve only had 4 that flat out refused to get in the aquatred. They were very patient! Yeah I was surprised at how cheap it was, too. this is REALLY cool and im AMAZED at the reasonableness of the prices. id love love love to get runkle in an aquatred. you can really see his hips working in that video you took from above. im impressed! I think it is also very cool they keep prices reasonable but i have no idea how they do that. You would think running costs alone would eat up that tiny profit margin! BUT who am I to quibble 🙂 Enjoy that water Henry!! 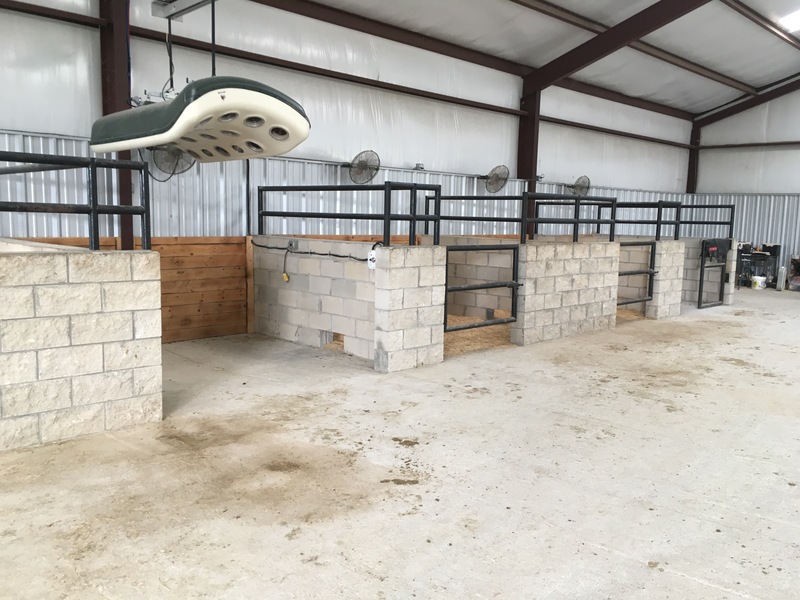 It’s a full time rehab facility with lots of horses boarded there at one time, so several of the machines run all day every day. Some of the rehab horses go in the aquatred twice a day. Those are the ones that are probably paying the bills, whereas the haul-ins are more like icing on the cake. DUDE that’s awesome and so cheap!! I was expecting like, at least $100 for each therapy session. I think my bodyworker has an aquatread… might have to take D up there just for funsies! That’s how much I thought it would be too! $35 for the aquatred is nothin’. I love the idea of using water resistance as therapy- man I wish we had one of these facilities close to us!! I do too. So much less stress on the joints, but such a great workout. Wow, that is a lot cheaper than I would have expected! Very cool!! Okay, I had to try and it wasn’t good. Damn Illinois. Wow I’m so surprised at the pricing! I’ve heard amazing things about both, so good luck! It’s just great that you have the facility nearby and that the pony was a good boy who cooperated. Heck, I would think some horses would want nothing to do with the Equicizer and its scary “fences!” Love the diaper part – have to admit I never even thought about horses pooping in all the various swimming devices I’ve seen for them. Duh… 😀 I’m curious about the saltwater spa and injuries, though; having gone swimming in the ocean with various wounds I know that it hurts like a mutha when open skin first comes in contact with the water. I would think horses would strenuously object to that? Huh. I’d love to try the aqua tread. C is usually great with water and he has similar problem areas to Henry. C’mon Idaho! Let’s get fancy. Really cool! I’ve seen portable water treadmills at WEF and always thought they seemed great! How often do they recommend doing the aquatread for fitness benefits? They said once or twice a week was ideal if it was being used to augment an existing fitness routine (although even as little as twice a month would be beneficial), or up to 6 days a week if it was being used as the main source of fitness. That is a crap ton cheaper than I thought it would be. What an awesome place to be somewhat close to you guys! I am impressed with Henny’s braveness. I’m not sure Bacon would be so brave. Or pull off the diaper look quite as well. I’m not sure if he’s brave or if it’s just that I’ve broken his spirit so much that literally nothing surprises him anymore. I can see how that would add up for a horse in rehab, but that still keeps rehab way more affordable than I’d expect somewhere with nice new equipment like that. I can imagine Val briefly having a panic attack, but it’s definitely good to know something like this is so close! What a cool thing to have within a reasonable distance. I just looked it up and there is one in Kansas, surprisingly, but it’s about 2 1/2 hours away. That is super cool and also super cheap! Ha this is so wild. I love all the videos – esp the one showing how his back moves in the aquatred. It’s easy to see how and why it works for them! That’s so cheap. I would have thought it’d cost so much more. I wish I could do something like that for Nilla. She could use to exercise some back muscles. Wow, what a cool spa day for Henry! Great that it’s not crazy expensive either. This is awesome! I know there’s something in Florida, not far from where my trainer is, but I don’t think there’s anything up here in CT like that. That video of Henry walking in is priceless. B would literally NEVER accept any of that but I think Yankee would have a grand time! This was SO cool to see from above. All the muscles! So cool!! I’d love to take my Henry to a place like that!! And the price is so affordable! !